Mangaluru, Apr 12, 2015: A police team led by Mangaluru East police inspector T.D. Nagaraj raided a flat in Kadri and rescued five women allegedly used in prostitution. They have arrested four persons, including a woman, who ran the racket. The police had kept a watch on the activities in the flat located on the third floor of the apartment in Kudkori Gudde in Kadri for over seven days. The flat had been taken by Hazeera, a resident of Sakleshpur, two months ago. She has been accused of providing women to the male customers. Based on a tip off, the police raided the flat on Saturday and found five women along with Hazeera. While three women were from Mysuru, two were from Subramanya. One college girl from Mangaluru was also found. All the five rescued women have been lodged in a counselling centre in the city. 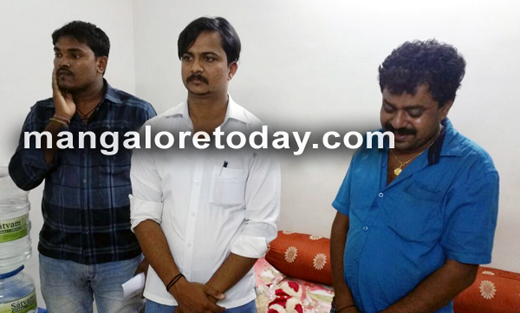 The police have arrested Hazeera and the three male customers Praveen Attavar, Manju Gadag and Prakash Bikarnakatte. All the four have been accused under Sections 3, 4 and 5 of the Immoral Traffic (Prevention) Act 1956. The five rescued women will be used as witnesses for the case, the police said.